North Shore Land Alliance officially acquired the Humes Japanese Stroll Garden property on May 23, 2017. The 7-acre Stroll Garden is in the Village of Mill Neck and is immediately adjacent to the recently acquired 28-acre former Humes property. The acquisition of this parcel completes a conservation corridor that stretches over 150 acres in the middle of the Beaver Brook watershed and effectively links the Stroll Garden and Humes property to Shu Swamp Preserve, Upper Francis Pond Preserve and the two Francis Ponds. The Japanese Stroll Garden was conceived more than fifty years ago by Mr. and Mrs. John P. Humes and has been owned and operated by the Humes Japanese Stroll Garden Foundation since that time. The Land Alliance purchased the Stroll Garden subject to a two-year mortgage extended by the Foundation with the intent of preserving the land on which the garden sits and continuing to operate it as a public garden. The unique and historic garden boasts an impressive collection of North American and Asian plants that constitute a beautiful Japanese landscape and impart a meditative experience. 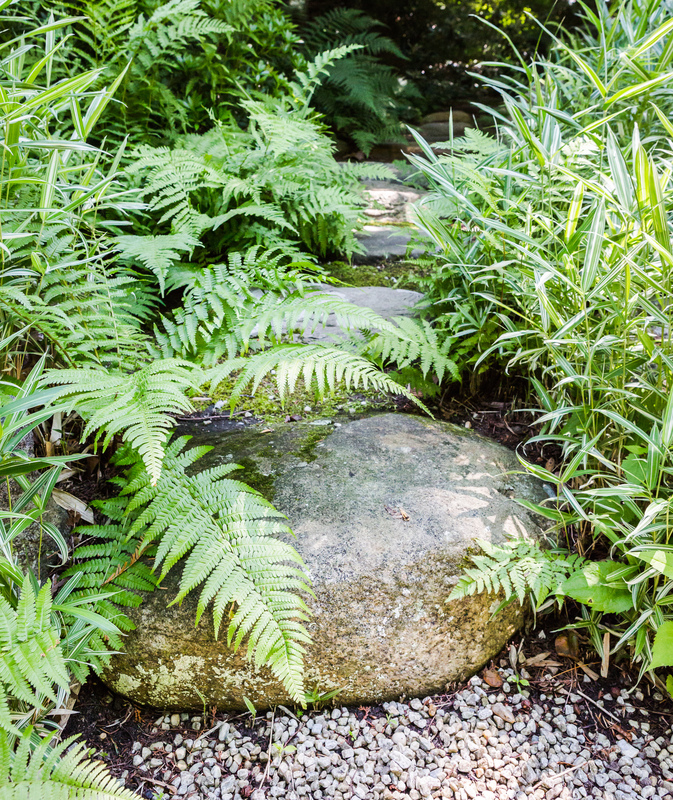 The defining feature of the garden is its stepping stone path, inspired by the intimacy of a mountain trail. A walk through the garden takes visitors through various twists and turns, including a “mountain peak,” before ending at the pondside teahouse. The garden experience is heightened by use of native plants, open space and existing woodland: the old-growth trees determine the direction of the path, terracing minimizes erosion and the garden’s native woodland remains mostly intact. Land Alliance staff, under the guidance of long time Stroll Garden manager Mary Schmutz, along a group of dedicated volunteers have already begun work to reclaim and restore the garden, which was closed for most of 2016. Aside from routine garden maintenance the Land Alliance plans to install a new deer fence, repair the existing wall around the garden and restore the existing greenhouse. Eventually the garden property will be incorporated into the larger Humes property, allowing visitors to walk from the Stroll Garden through Humes and on to Shu Swamp and Upper Francis Pond Preserve. Many thanks to those who have contributed to the acquisition and re-joined as Friends of the Stroll Garden. You have both made this important acquisition possible and ensured that funds will be available for continued maintenance. As many in our community know, this transaction has been years in the making and wouldn’t have been successful without the help of our pro bono counsel, Jonathan Moore, and counsel for the Stroll Garden Foundation, John Lander. Stay tuned for more information about the garden opening. We are still welcoming contributions as well as volunteers and look forward to announcing a date soon! A special use permit must be obtained from the Village of Mill Neck before we can officially open the garden to the public. 1960 – Lawyer John P. Humes (later Ambassador to Austria from 1969 to 1975) and his wife, Jean, visit Kyoto. Inspired by their visit, they spend the next 4 years transforming a wooded corner of their Mill Neck estate into a meditative Japanese landscape, including an imported tea house. They engage a Japanese landscape designer and his wife, Douglas and Joan DeFaya, to design and direct the installation of the original two-acre section of the garden. 1980 – 1982 – Humes forms the Humes Japanese Garden Foundation for the purposes of maintenance and preservation of the Stroll Garden. Humes engages Stephen Morrell as curator to rehabilitate and expand the garden, and to facilitate its transition from a private to public garden. 1985- 1993 – John P. Humes dies and the management of the garden passes to the Humes Japanese Garden Foundation. The Japanese Stroll Garden opens to the public. With the garden struggling financially, the Garden Conservancy assumes management of the garden. 2000 – 2001 – Mrs. Humes, the garden’s co-creator, passes away, adding funds to bolster a diminishing endowment for the garden. Master craftsman Peter Wechsler constructs a new entrance gate from native Eastern red cedar, using traditional carpentry methods of the master temple builders of Japan. With funds from the Freeman Foundation, the Stroll Garden begins its education outreach program to bring the Japanese garden into the classroom. 2012 – 2014- The garden’s tea house, beautifully restored by Peter Wechsler thanks to a grant from the Peggy N. and Roger G. Gerry Charitable Trust, is dedicated at a special ceremony and named Chikufauan, Japanese for “bamboo wind tea house.” The Humes Japanese Garden Foundation takes over management of the garden. 2017 – The Land Alliance purchased the Stroll Garden, Friends of the Humes Japanese Stroll Garden is revived and, thanks to a generous and caring community, the Stroll Garden returns to its glory days. Yeah! Fantastic! A garden gem and lovely property. Well done. When is the garden open for visitors?